Who Gets The Water And Who's Hung Out To Dry? 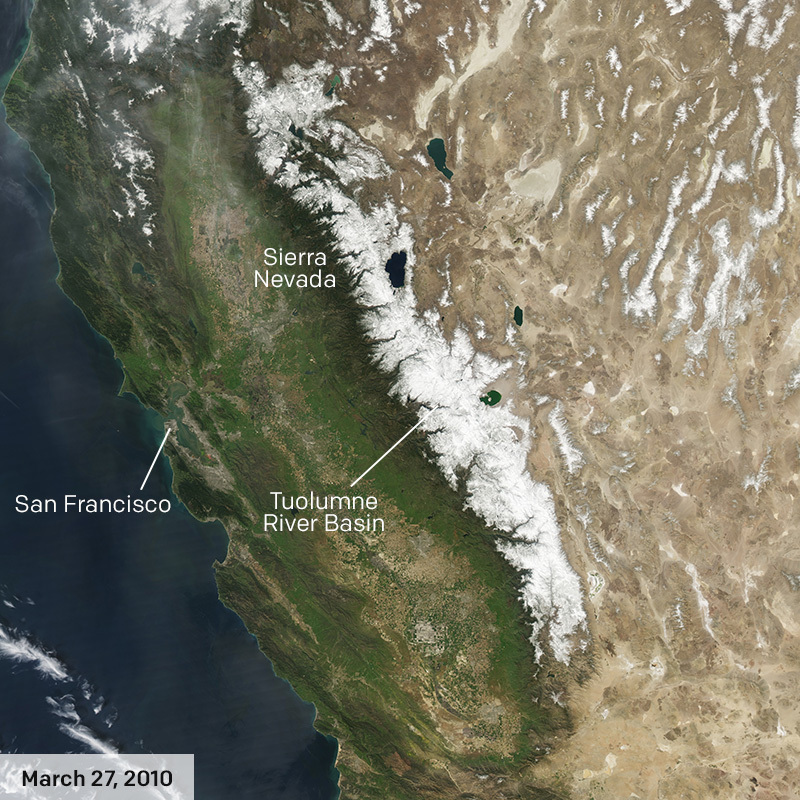 Editor's Note: The California State Climatologist has noted that while El Niño rains will help the state, which is in its fifth year of drought, the water storage in long-term reservoirs remains below normal levels. The historic drought has dredged up old feuds over who can lay claim to water in a thirsty state. As the powerful lobby for the agricultural industry—which currently consumes 80% of California's water supply—cries for more water to be pumped to their farms in the arid regions of the Central Valley, just who would be left high and dry? 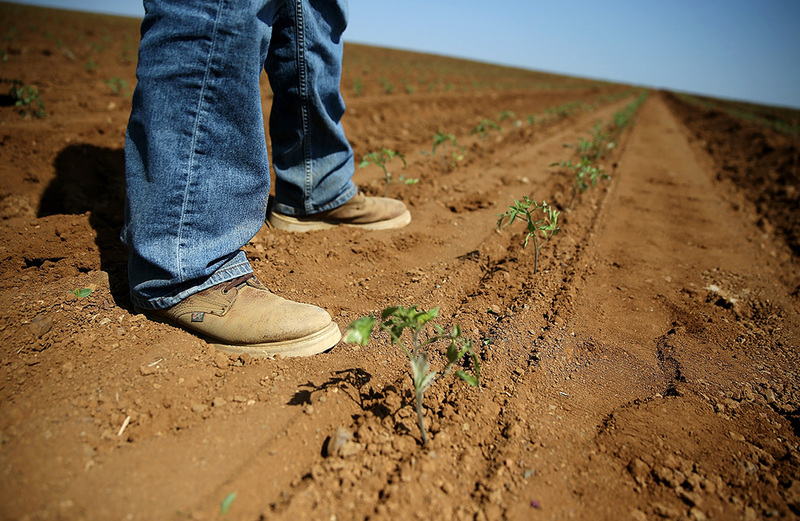 Farmer Joe Del Bosque stands next to a row of newly planted organic tomatoes on April 23, 2015 in Firebaugh, California. As the state was entering its fourth year of severe drought, farmers in the Central Valley struggled to keep their crops watered. Many opted to leave acres of fields fallow. 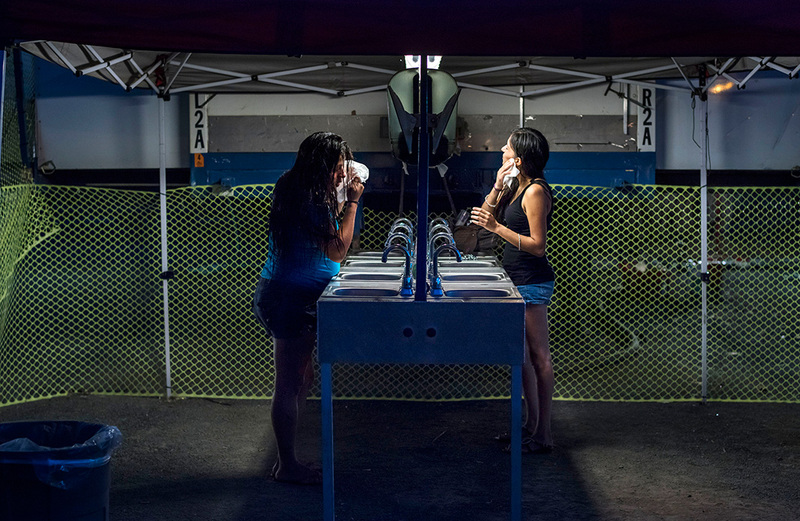 Sisters Amanda Perez, left, and Miranda Perez dry their faces after taking showers at portable units available to use for free in Porterville, California on April 13, 2015. In drought-plagued communities that aren't part of the State Water Project, water scarcity has forced many changes. 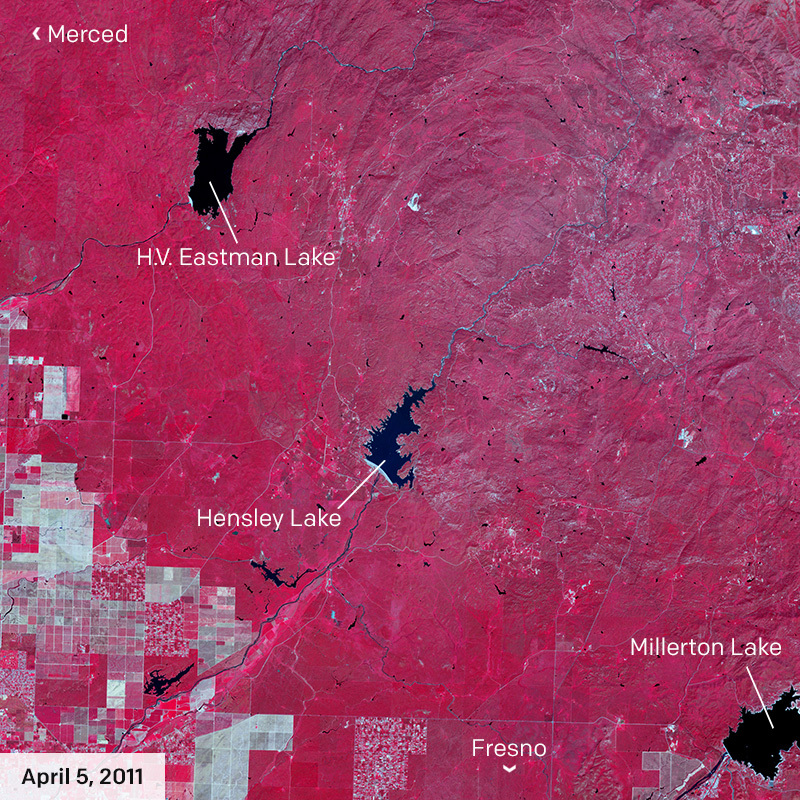 1California's record-breaking drought brought many things long submerged back to light when the water line dropped. Long-abandoned cars were discovered in shallow rivers, ghost towns emerged at the bottoms of lake beds, and glints of gold in the near-dry streams sent amateur prospectors hotfooting it back into the hills. 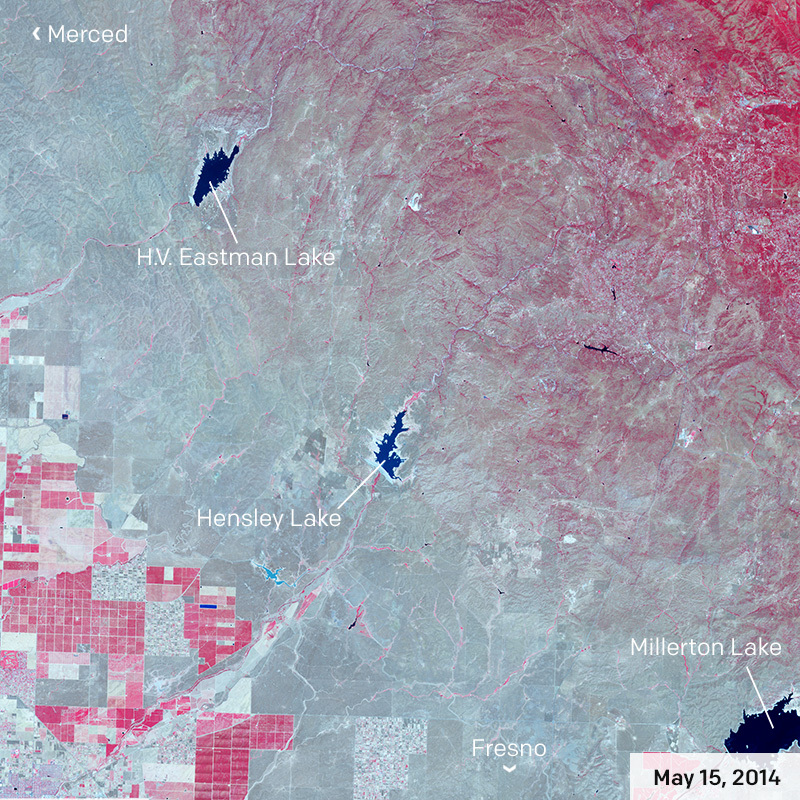 In these two false-color views captured by NASA’s Terra spacecraft, the Central Valley landscape has browned and lakes have shrunken after three years of drought. 2 On April 1, 2015, Governor Jerry Brown announced California’s first-ever mandatory statewide water restrictions, calling for a 25% reduction in urban water use from 2013 levels. Standing on dry grass where there should have been five feet of snow, the governor said, “We are in a historic drought—and that demands unprecedented action.” Notably absent from the restrictions are any cutbacks in water use by the agriculture industry which accounts for 80% of California’s annual water usage. The Sacramento and the San Joaquin Rivers meet in the Delta in Northern California, April 20, 2015. 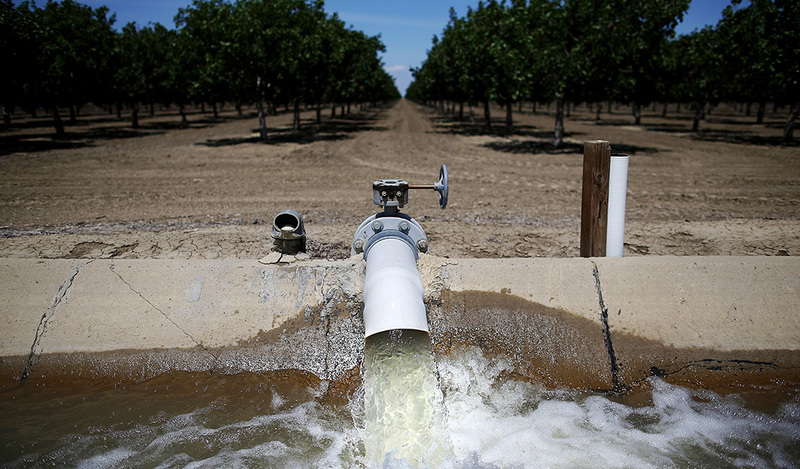 Water is pumped into an irrigation canal at a Central Valley almond orchard on April 24, 2015 in Firebaugh, California. 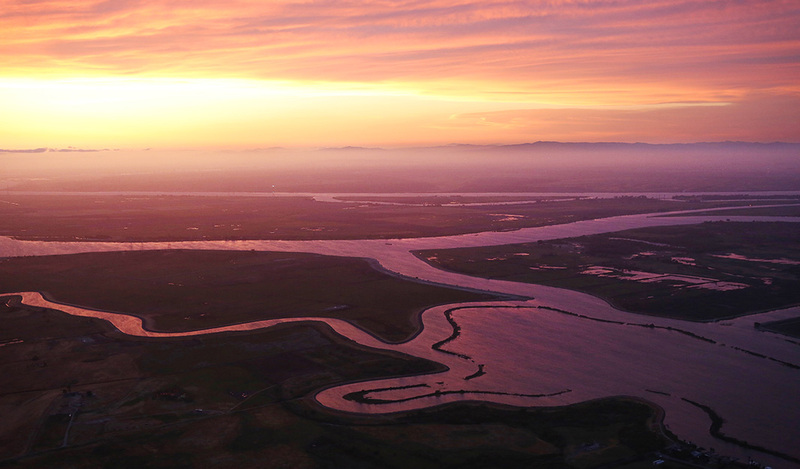 The Bay-Delta's watershed not only fulfills critical economic and ecological needs, it also provides drinking water for 25 million Californians: two-thirds of the state's population. 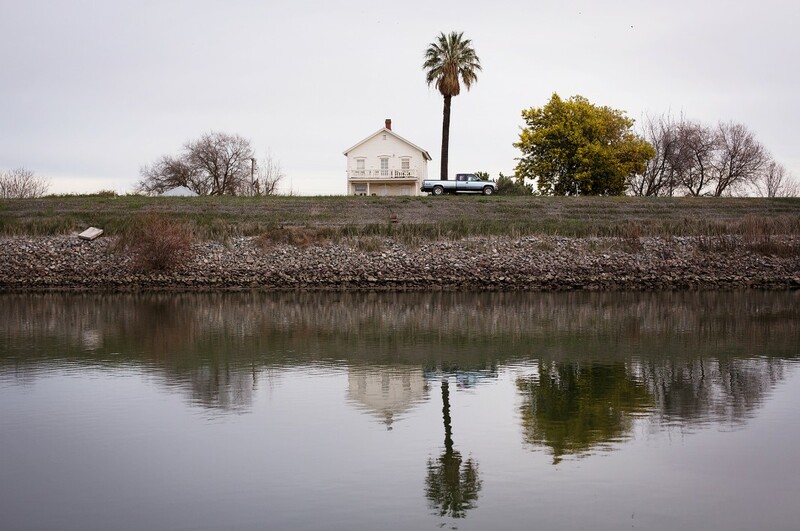 3At the heart of California's water politics is the Sacramento-San Joaquin Rivers Delta, which flows into the San Francisco Bay, forming the largest estuary on the west coast of the Americas. 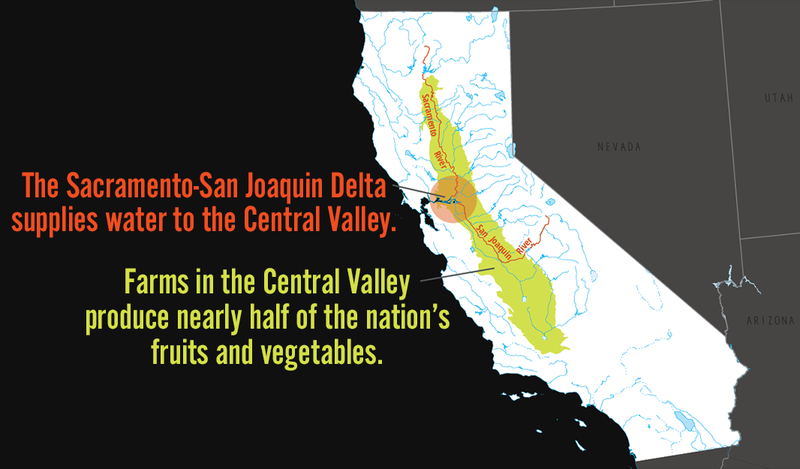 The Delta supplies water to farmland that produces almost half the nation's fruits and vegetables. It is also home to hundreds of species of plants and animals, some found nowhere else on Earth. The shortfall of fresh water flowing through the Delta would further degrade an already taxed ecosystem, jeopardizing both native species and the local economy. Brown, who was also governor during the 1977 drought, proposed a similar water funneling plan at that time. That project, dubbed the Peripheral Canal, was rejected by voters in a 1982 ballot measure, but became the focus of a north-south battle over water. 4The historic drought has reignited old water rights tensions as politicians and corporate interests seize upon the scarcity of water as a political tool. 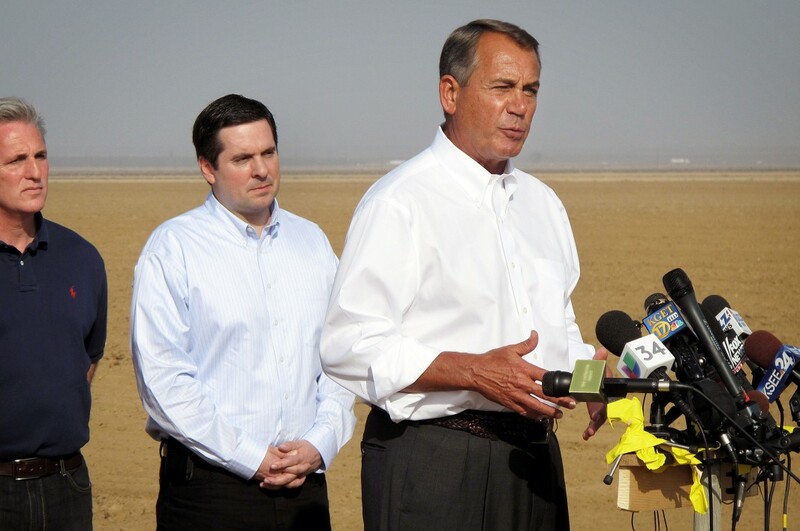 Standing in a parched field in California's Central Valley in January 2014, then-U.S. House Speaker John Boehner (R-OH) referred to the catastrophe as a “man-made drought” and called for more freshwater to be pumped from the Delta to corporate agriculture. “How you can favor fish over people is something people in my part of the world would never understand,” Rep. Boehner said. Had he looked around, he would have seen the faces of many other farmers, fishermen and countless other water-users whose lives would be disrupted by a mega-water grab. The Water Commission Act took effect in 1914, the year after Henry Ford introduced the assembly line. It established the state's surface water rights permit process and is a predecessor to today's water code. The system gives priority to rights holders with the earliest documented claims, known as the "First in Time, First in Right" doctrine. The most senior water rights date to the 1800s. 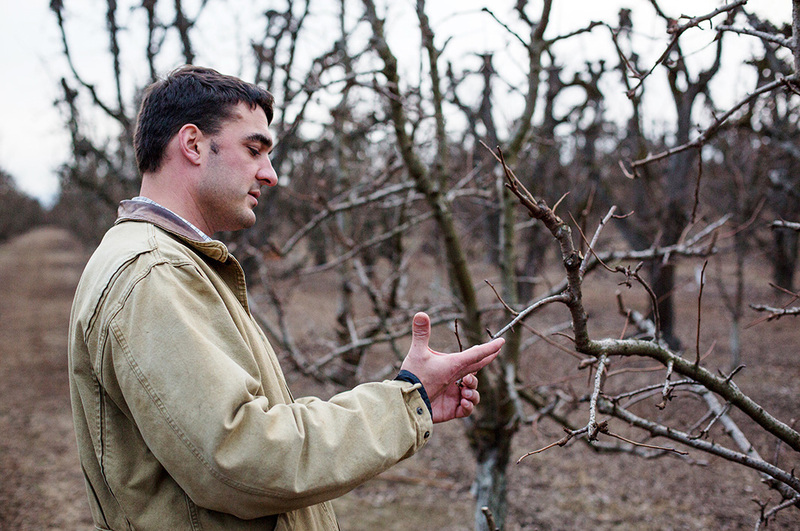 Baker, tending to a tree in his pear orchard. A farmhouse on Steamboat Slough in the Sacramento-San Joaquin Delta. 5 Steamboat Slough is the shortest water route between Sacramento and San Francisco. A century ago, Delta farmers used to board the steamships and load up their crates of pears, plums, peaches and other goods to sell downstream. 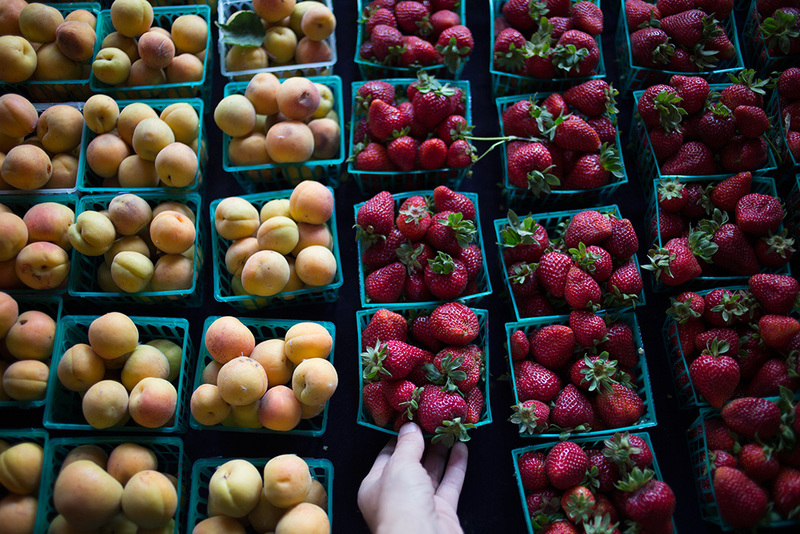 Though the ships don't pass through as often these days, Delta farming is still a significant industry with estimated agricultural revenues of nearly $800 million in 2009. More than 75,000 square miles, the Bay-Delta watershed is nearly as large as Nebraska (76,824 miles2), and dwarfs the states of Vermont and New York (9,216 and 47,126 miles2, respectively). Nearly half of the surface water in the state begins as rain or snow that falls within the watershed. 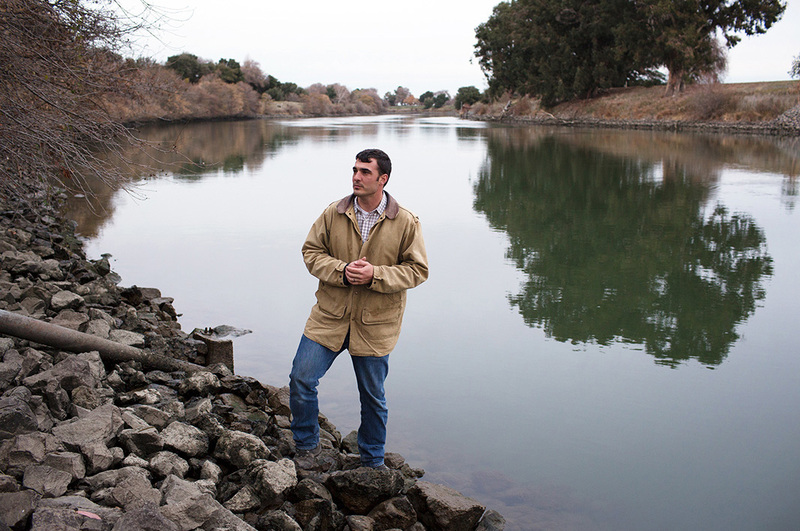 Brett Baker, a sixth generation farmer in the Delta, says plans like any congressional bill which threatens to roll back the Endangered Species Act or Governor Brown's Twin Tunnel proposal will only lead to a saltier Delta. A saltier Delta is a sicker Delta, he says, with saline water poisoning crops and killing off or displacing native species—meaning such water grabs will not just erode the ecosystem but an entire way of life. Baker explains that riparian users—people whose property borders the waterways—have contracts with the state that promise a certain quantity of water, but makes few guarantees about its quality. “The state has a contract with us but if they want to break it, they may just do that and owe us money,” he says, explaining that the state would make some reparations to people if tainted water forced them to leave their land. 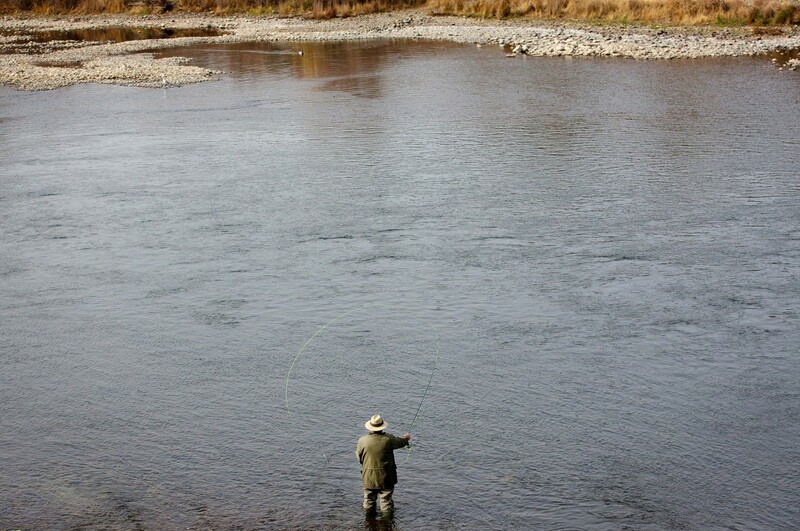 A fly fisherman in the American River casts for salmon near the Nimbus Dam on February 5, 2014. It makes you wonder, what are you defending after all? 6 Over the course of his lifetime, Baker reckons he's already witnessed decline in the biodiversity of the region due to mismanagement of water. "I had a lot of buddies that went over to Afghanistan and Iraq and something we always used to do together was salmon fish,” Baker says. “They went away to this foreign land and did unspeakable things and they did them because they believed they were from this place that was wonderful and deserved protecting." "Then they came back and they couldn't go salmon fishing because the environment was so degraded. It makes you wonder, what are you defending after all?" Cunningham, on the Delta's Bradford Island. 7 Karen Cunningham is a Delta cattle rancher for a longtime ranching family that has had to sell off a third of its herd due to the lack of grazing land caused by the drought. 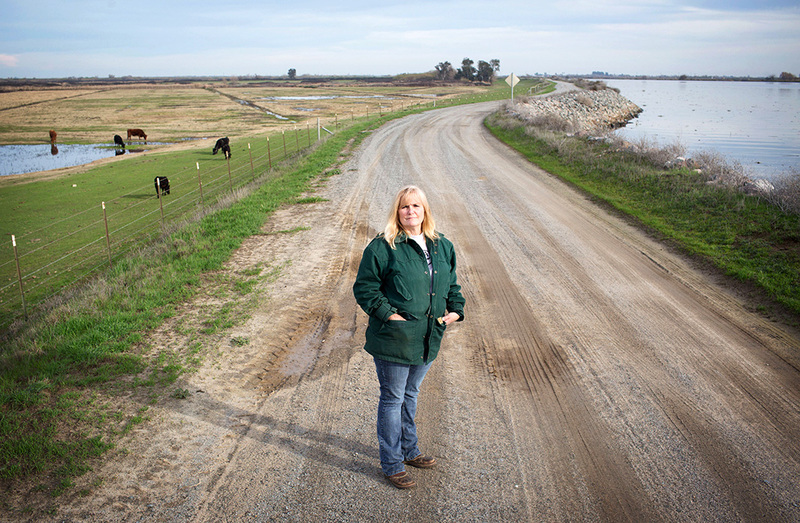 She says the ranchers in the Central Valley face the same problems as she does in the Delta, but fears that any water grab could further threaten her ability to keep her cattle healthy. Simpkin, at the South Fork of the American River. 8According to a 2009 state report, non-motorized boating is a $1.7 billion industry in California. 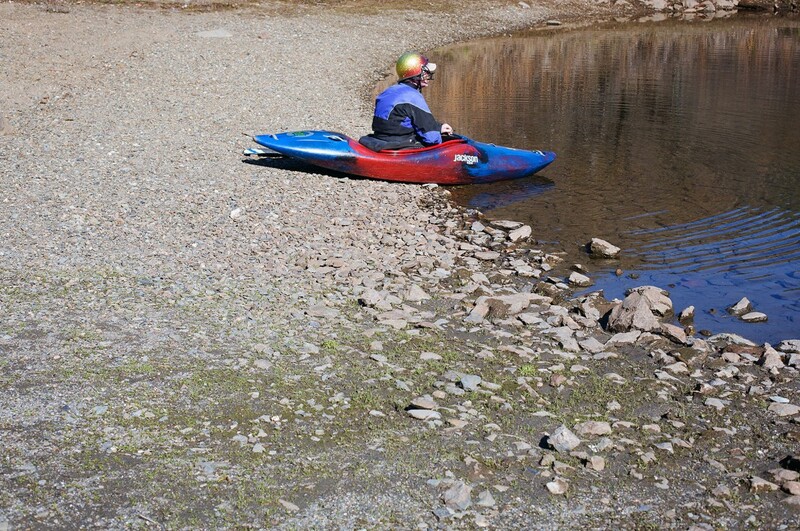 Simpkin, who kayaks in the American River about 150 times a year, knows some people who are feeling the burn. 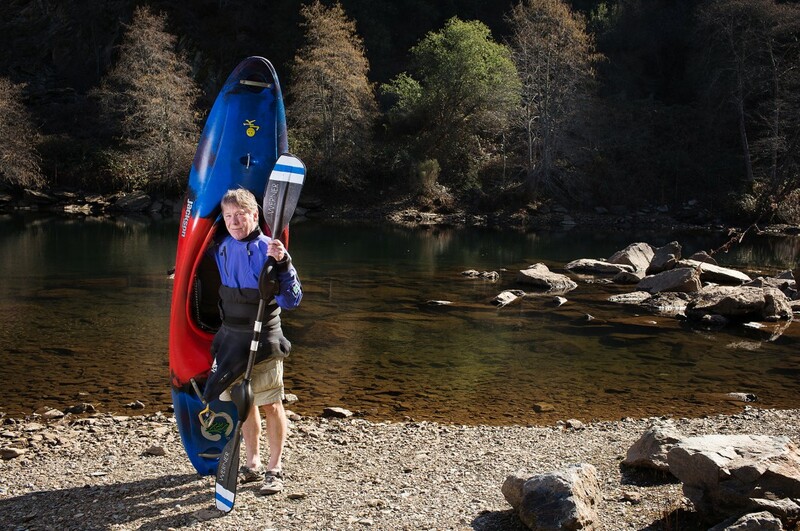 One such person is Keith Miller, who owns California Canoe and Kayak in Oakland. “Normally, this time of the year, hundreds of paddlers would be out on the coastal streams and in the beautiful wild and scenic rivers. But there's no water right now,” Miller said of the 2014 whitewater season. Jones, near a side channel of the American River. 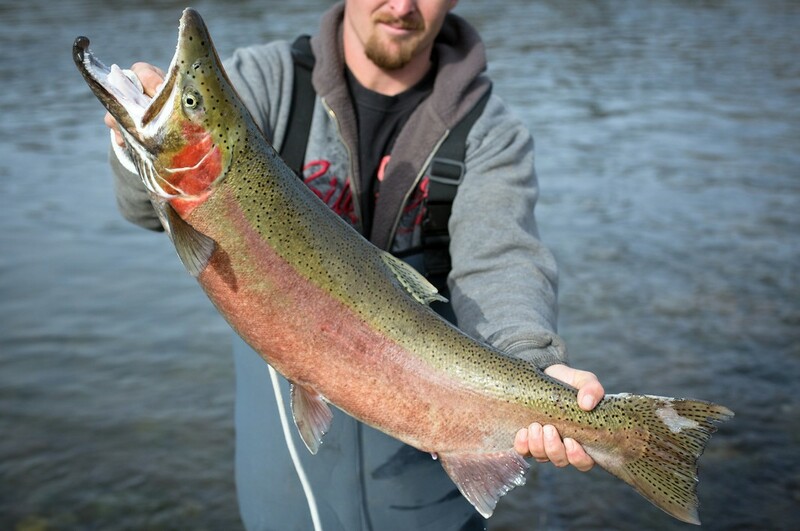 A fisherman holds a steelhead on Feburary 5, 2014, shortly before the American River closed for recreational fishing until the spawning season ended. 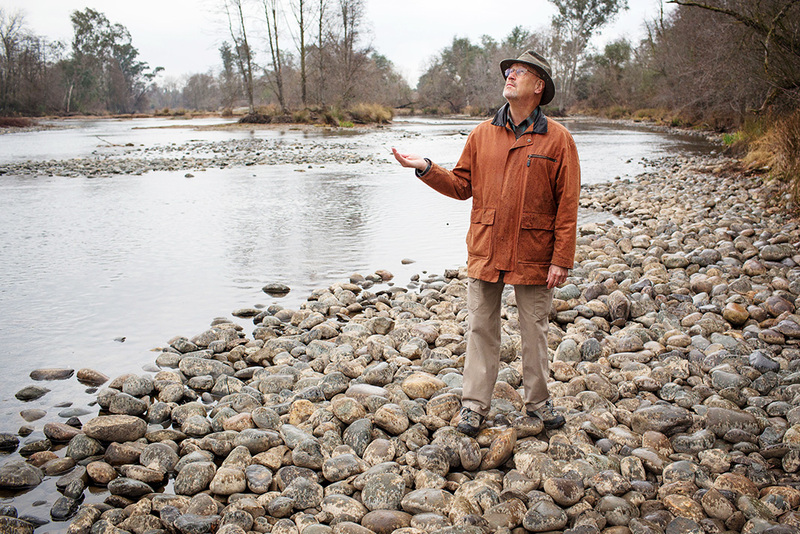 9Jim Jones, who serves on the Advisory Council of the Save the American River Association, has lived along the Sacramento River tributary for 40 years. 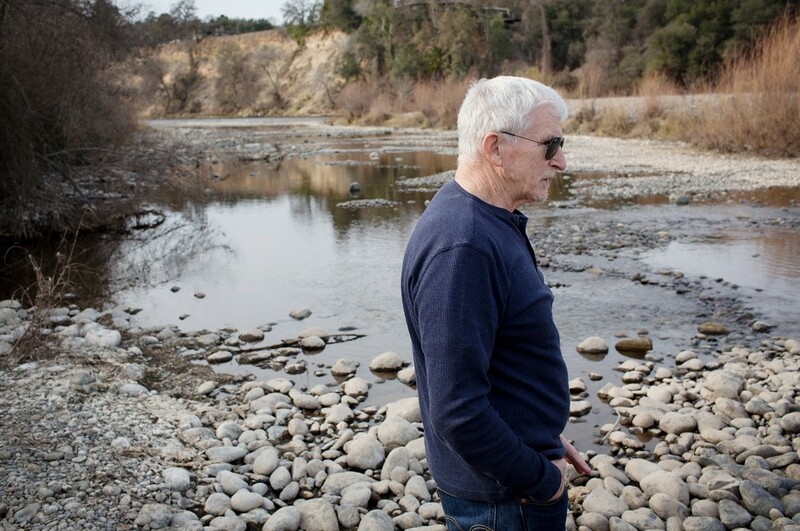 He said in 2014 that many of the local fishing groups, and even the tackle shops and river guides, whose very livelihoods depend on recreational fishing, asked the Department of Fish & Game to close the American River and other streams and rivers to sport fishermen. With water levels too low, the fishermen feared the eggs laid by the spawning Chinook and steelhead were at risk of dying in the shallow water. When a salmon spawns, it lays its eggs in shallow gravelly areas called redds. Typically, the riffling water flowing through the shallows supplies oxygen to the developing fish, but with such low water levels many of the redds are either receiving low oxygen flow or are completely dewatered, killing the eggs. 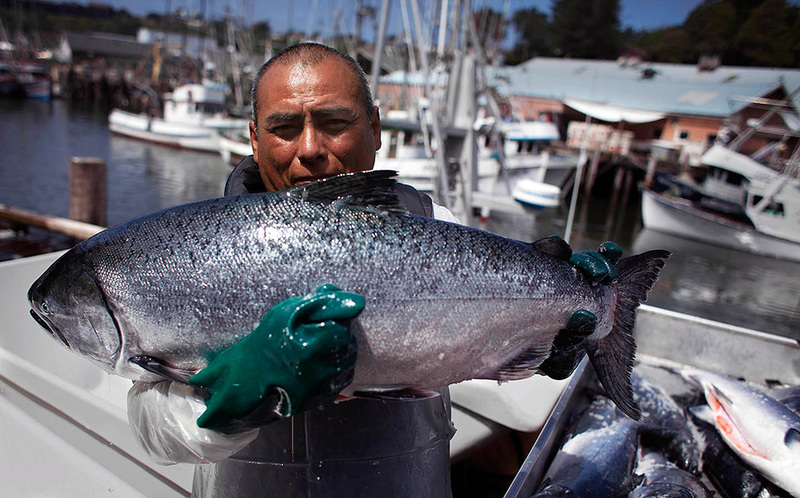 Jose Chi holds up an impressively large king salmon caught in the Pacific Ocean near Ft. Bragg, California. 10 Commercial fishermen are just now beginning to feel the effects of the drought in the form of restrictions on the water. If the salmon can’t spawn in the rivers this year—due to the drought or water transfers or both—fishermen will feel the pain in the coming seasons. John McManus, head of the Golden Gate Salmon Association, says commercial fishermen better be saving their money. Minton, by the American River. 11Jonas Minton is a water policy advisor for the Planning and Conservation League, an environmental non-profit in Sacramento. “This drought is bringing into focus an even more harsh reality,” Minton says. 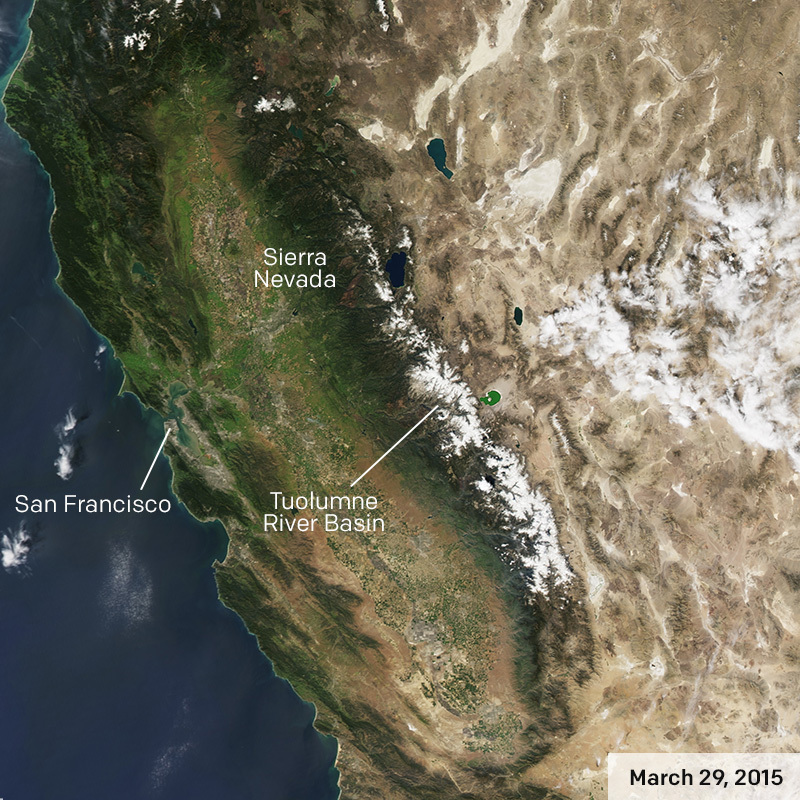 “For decades, California has been using more water than Mother Nature has provided. Each year we have overspent on the order of 3–4 million acre feet of water. Much of this has been unsustainable overdrafting from groundwater that was accumulated literally over centuries." "In addition, we have stolen water from our rivers and bays with the tragic consequence of ecosystem destruction." With 1,400 reservoirs in California, Minton says that in 2014, the agencies provided much of the available water to corporate agricultural interests in the Central Valley primarily to feed the almond and pistachios farms, water intensive crops planted in the middle of a desert. Frantz, at his home in Shafter, California. He has witnessed a watershed of changes from the days his grandfathers cultivated the land with mules. 12 Tom Frantz, a retired school teacher and almond farmer who has lived in Kern County his whole life, understands the hurt that his neighbors are experiencing. “The drought is already costing billions of dollars and it can go far higher,” he says. “Some farmers don't have enough water from underground and are looking to buy water from wherever they can to save some trees. They just want the minimum water, not even to get a crop, just to keep the trees alive. 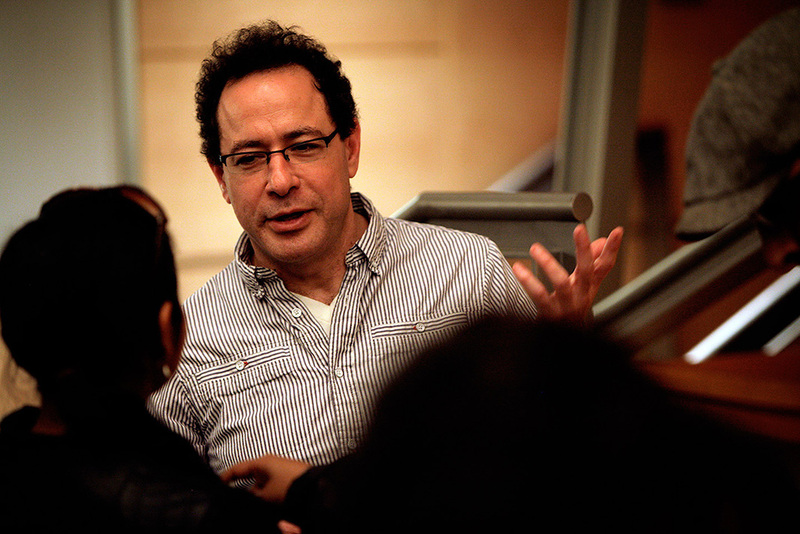 It's a serious business, but we have to balance all of that." While Governor Brown was calling for water conservation across the state, he also quietly green-lighted water-intensive fracking projects to proceed in southern and central California, without any reviews of the environmental impact of such work. 98% of the drilling sites in the state are located in places of high or extreme water stress. Most of the sites are located in the already-thirsty Kern County, which has an active agricultural sector with over 800,000 acres of irrigated farmland. 13"California is facing twin crises: One is water and the other is climate. Fracking takes us in the wrong direction for both of those,” says Hollin Kretzmann, of the Center for Biological Diversity, an Earthjustice client in a case challenging the illegal injection of fracking wastewater into protected sources of water. “It uses a tremendous amount of fresh water that once used for fracking can't be used for anything else. It all ends up in underground disposal wells after it becomes mixed with chemicals—it becomes contaminated and taken out of the water cycle." 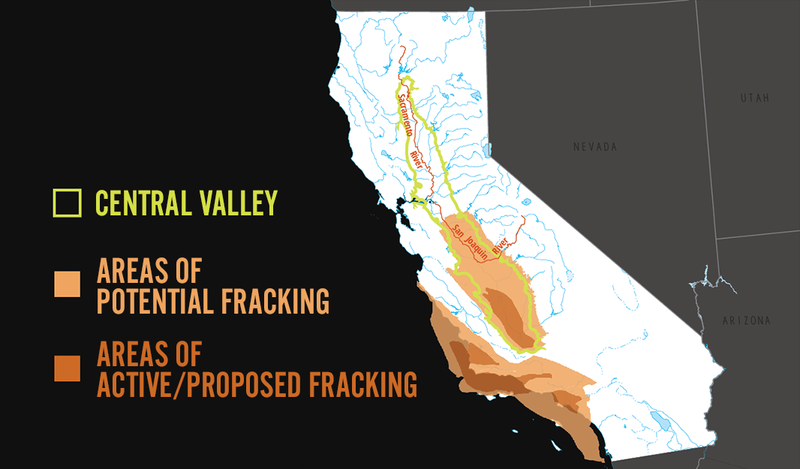 The Center for Biological Diversity is also a client in an Earthjustice case which could block a federal plan to open up more than a million acres of public land and mineral rights in central California to drilling and fracking. 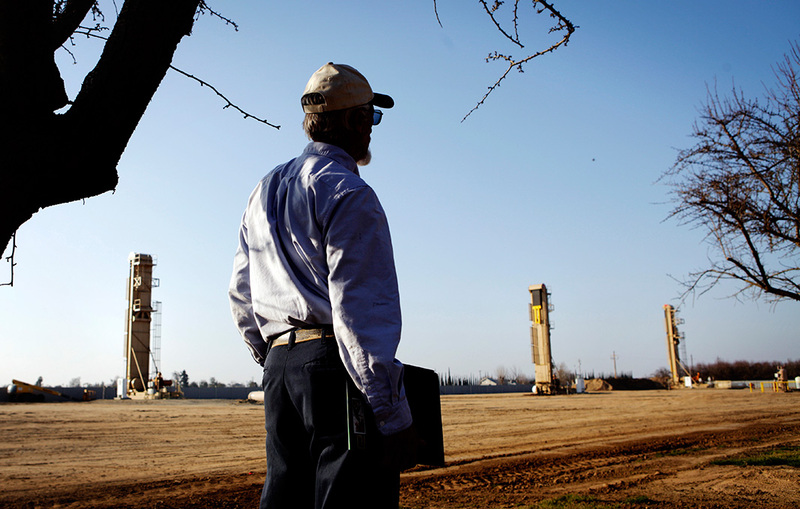 A farmer watches oil wells that have sprouted near almond orchards in Shafter, California. 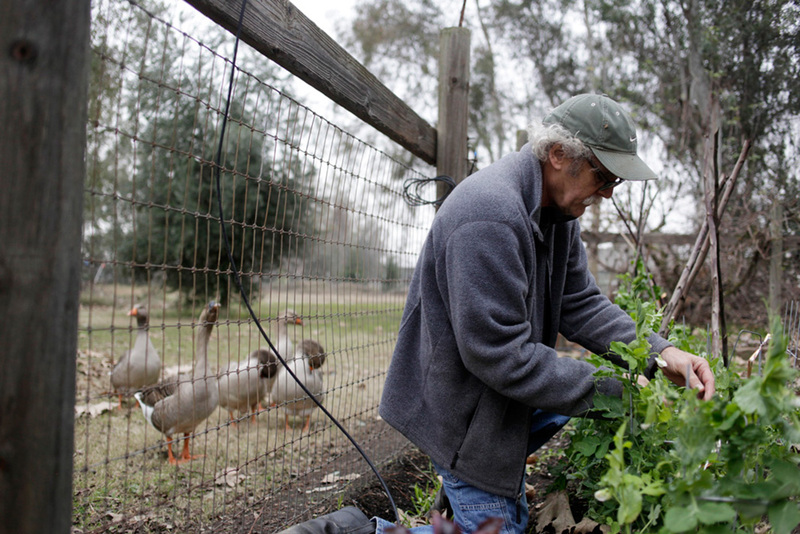 Almonds—80% of the world's supply are grown in California—have gotten a slew of bad publicity. But alfalfa uses even more water: about 15% of the state's water supply, compared to 10% for almonds. That doesn't mean we're bingeing on sprouts: 70% of alfalfa hay grown in the state goes to feed dairy cows. 14 Frantz, the retired almond farmer, recently set out to document the process of fracking in his town videotaping at a drilling site nearby one of the farms. While filming, something caught his attention: black viscous fluids being discharged into an unlined dirt hole only ten feet away from the edge of an almond orchard. He reported the sighting to the local water agency, which investigated and subsequently fined the oil company for dumping diesel and crude oil used to lubricate the drill. 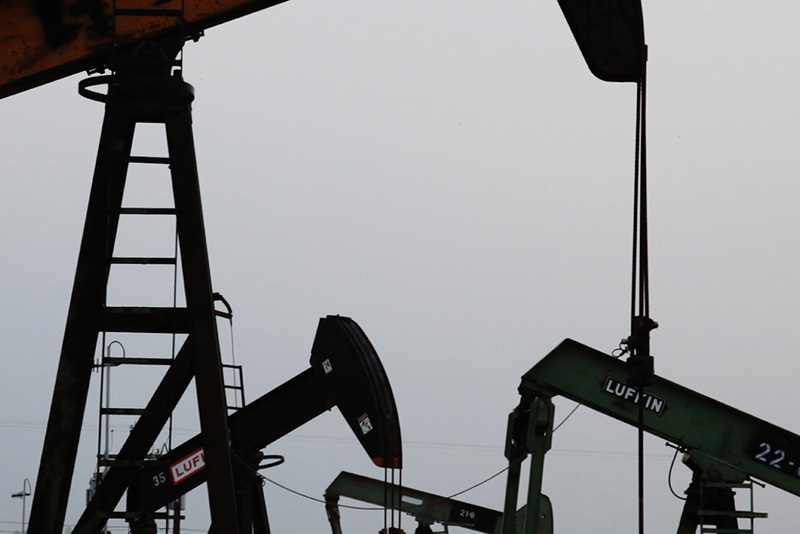 Drill rigs, in California's Central Valley. Attorney Will Rostov has worked for years on litigation related to fracking practices in the state. 15 Frantz’s fear was not unfounded. Even worse, the California Division of Oil, Gas and Geothermal Resources allows oil companies to inject industry wastewater and other fluids into protected aquifers despite the water-scarcity in the state. “It’s astonishing that in the midst of the worst drought on record, our state agencies continue to allow the oil and gas industry to inject millions of gallons of oil industry waste into California’s dwindling underground drinking water supplies,” says Will Rostov, an Earthjustice attorney working on the case challenging California’s regulation. 16 The drought crisis has revealed a number of serious problems with the way water is managed in California. That wasteful, polluting practices like oil and gas exploration are allowed to continue in the midst of an acute water shortage shows there is still a long way to go toward rethinking the management of such a precious resource. That massive, taxpayer-subsidized farms are planting water intensive crops like almonds in the middle of semi-arid regions that, even in a wet year, don’t naturally receive enough rainfall to sustain the crops should force a similar rethinking of California’s agricultural practices. Icon created by Kate Vogel for the Noun Project. 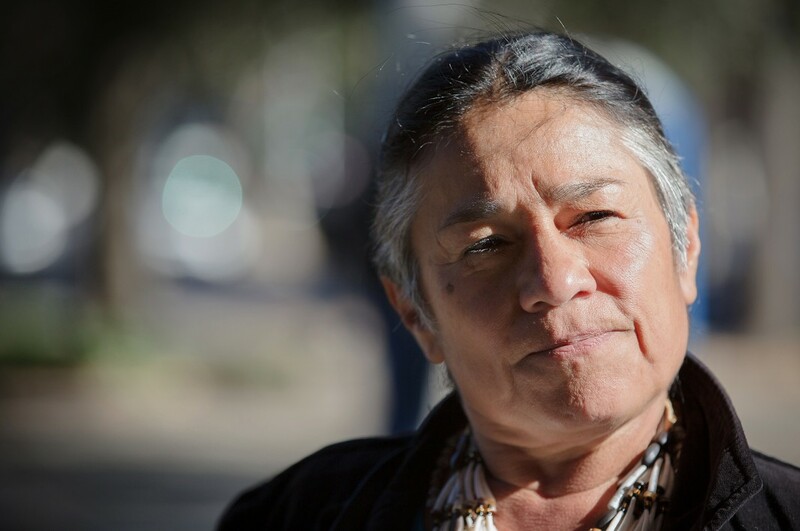 Caleen Sisk, leader of the Winnemem Wintu tribe, believes the problems are rooted in a history of disregard for the ebbs and flows of the natural world. "The salmon for us are the indicators of how healthy our world is," says Sisk. The Winnemem Wintu tribe has inhabited the McCloud River watershed area near present-day Redding, California for 6,000 years. The man-made destruction of the natural hydrology of the region through the damming of rivers and diversion of water has decimated the salmon population and forced the displacement of the tribe from its traditional lands. The tribe now denounces any project that could further damage the natural waterways, including Governor Brown's Twin Tunnel proposal. "We don't start out to be activists or protesters, but when there's nowhere else in the world that you can go to protect your way of life and your culture for future generations, you have to do something," Sisk said. 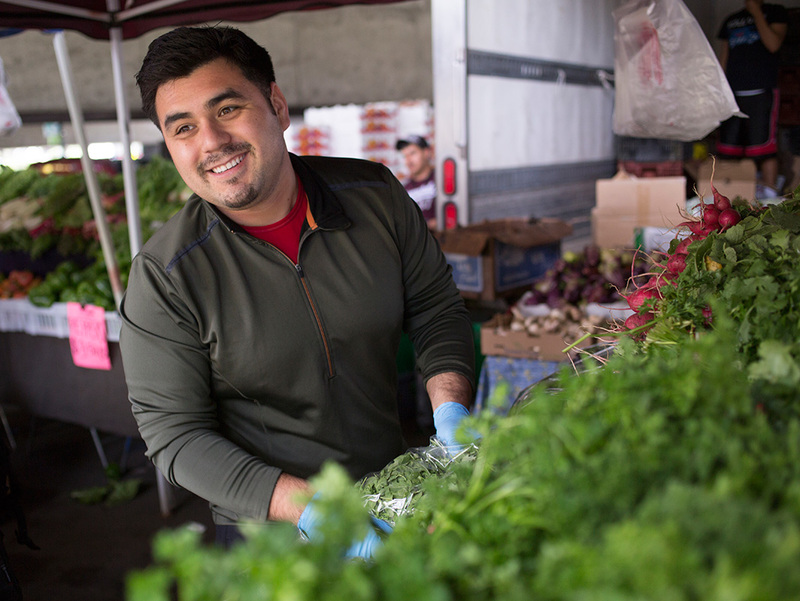 Ledesma, working at the Saturday farmer's market in Oakland, California. 17 The water crisis has produced its fair share of bad ideas, panic, and political opportunism, but it can also be the catalyst that forces positive change. There are already good actors who have long understood the need for conservation. Noel Ledesma is one such person. Noel’s father owns Ledesma Farms, an organic operation with acreage in the South Bay and near Fresno in the Central Valley. The Ledesma family has operated for years under a lean water system, primarily relying on drip methods and water recycling technology. 18 Earthjustice is fighting a series of legal battles related to various areas affected by the drought. Besides litigating against destructive fracking practices, the organization is fighting for strong protections of endangered fish species, and the renegotiation of long-term water contracts with corporate agriculture interests that were established under an inadequate and since-invalidated biological opinion. Earthjustice is also representing the grassroots organization Restore the Delta in ongoing hearings before California’s State Water Resources Control Board that will determine the future of the Twin Tunnels proposal. By Maggie Caldwell and Chris Jordan-Bloch. First published February 11, 2014. Updated September 7, 2016. Abnormally dry to exceptional drought intensity conditions, for July 15, 2015. Issued by U.S. Drought Monitor, a joint production of National Drought Mitigation Center at University of Nebraska-Lincoln, USDA and NOAA. Map by David Simeral, Western Regional Climate Center / NDMC-UNL. Earthjustice attorneys have worked successfully to establish, enforce, and strengthen protections for the Bay-Delta and its native species for more than two decades.